I am very happy to guest host "Only" series started and created by Pari. First of all, I would like to thank Pari to allow me to guest host this event. I am a big fan of hers. You must visit her blog (if you are not already following, which I am sure you are), to check her delicious collection of recipes. With the lifestyle, many of us are leading these days (mostly sedimentary), it is very important for us to adapt the practices which help us become and stay healthy. One of the most important part of adapting a healthy lifestyle is the selection of which kind of foods we make, eat and share along with the physical activity that one must choose appropriate for themselves and their families. And, who doesn't know the benefit of using recipes which do not need oil or use very less oil and also the recipes which are less in calories so that we eat delicious foods with no guilt/sin at all. Isn't that like dream come true for all of us. As you all may know already this series also will have a winner. The winner gets a book from Pari, the details of which are here. Winner will be chosen by me by random.org and he/she has to provide me with an address in India within two days of the winner declaration else a new winner will be chosen by me. As you know that the cookbook giveaway to the winner is sponsored by www.tarladalal.com and it is based on the theme of the month. 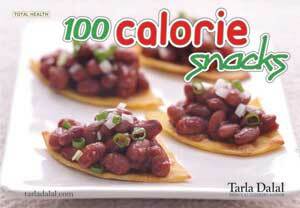 Since this month we indulge into a health conscious food indulge, the offered giveaway is 100 Calorie Snacks. Any number of fresh entries can be sent but only 2 enties from the archive will be accepted. Archived entries to be reposted, else will not be accepted. Only vegetarian entries (egg allowed) will be accepted. The entry should be linked back to this announcement and Pari's event announcement page. Last Date of entry is September 30th 2010. The winner will be chosen by me by random.org after the round up is completed. Please send an email @ priya.mitharwal@gmail.com in the following format. I will post the round up within 7 days of event completion unless there's an emergency. So, put your chef caps and start sending delicious and healthy entries features low oil or low calories. Sounds so healht event Priya.. Healthy waiting, me already waiting fr the roundup! Priya can you include 'My Favorite Recipe' in your liset of events please? Happy hosting priya..Btwn, would you like to add the baking from a book event, ends sep 16th and hosted in my blog to your list? hi priya..do count me in both your ongoing events..i really have to think hard with this low cal recipe :P..
hi priya, have a doubt,we can send any dish that is low in oil/Cal right?? Vary nice post About hosting. Gr8! I have few entries for this :-) Happy hosting.